This was a refreshing change from the increasingly dark and mean presidential campaign. 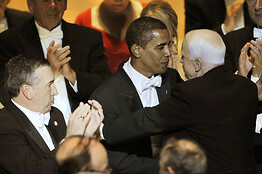 John McCain and Barack Obama managed to sit down together at the 63rd annual Alfred E. Smith foundation dinner. It’s become somewhat of a tradition for the presidential contenders to appear at this white-tie event to raise money for the charitable foundation, and actually seems to lighten the mood. The candidates basically roast each other, and spare no expense mocking themselves either. You can check out all the videos below. Quite honestly, I think that McCain was a better tonight, but Obama definitely scored some big points with a few of his jokes. Both quickly addressed the ‘That one’ comment from the debate (Obama explains that his name is actually swahili for ‘that one’. McCain says it’s a nickname, and Obama’s nickname for him was ‘George Bush’). Perhaps my favourite moment from Obama’s side was his mockery at his own perceived arrogance. When asked for his greatest strength, he said his humility, and for his greateset weakness he said he was a little too awesome. Also, keep an eye out for the middle name jokes and Obama’s wicked jab at Giuliani. I’ll stop spoiling things now, and let you enjoy it.